We have already touched on low tech and no tech AAC communication strategies. For every device that we use in our daily lives, there is a specialised AAC alternative. 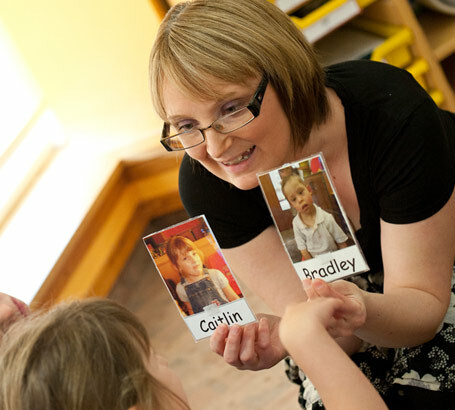 For pictures and photographs, there is the TOBI; and for symbols there are Widgits, PCSs, Makaton, communication books and talking mats. The word picture can describe an illustration in a book or a drawing on a wall. Are these displayed on the wall or in a photo album? Are they in the form of slides on the whiteboard? Are you using matt laminate to avoid the light reflecting off the picture and making it impossible to see? Taken from 'Access to technology for people with PMLD'. TOBIs can be used with individuals who have difficulty understanding two-dimensional visual symbols (i.e. photographs, line drawings). TOBIs can be any line drawing or picture that is cut out in the actual shape or outline of the object that they represent. The individual can see the symbol and the outline of the shape, which helps him/her to more readily understand two dimensional symbols. TOBIs are usually larger than typical two-dimensional symbols. 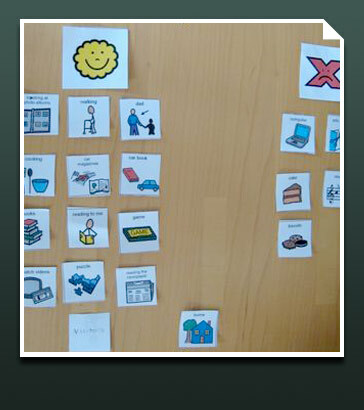 Abridged from a presentation by Barbara Bloomfield, MA CCC-SLP, 'ICON to I Can: Visually Based Strategies'PMLD''. A picture conveys a lot of information at once and its focus may be unclear, while a symbol focuses on a single concept. This means that symbols can be put together to build more precise information. When you speak or write, your words act as symbols for what you are trying to convey. Some children are unable to use words because they are not able to speak them and need some other symbol system available to get their message across. We make use of symbols in everyday life. Traffic signs are particular examples of pictorial symbols. Some symbols are more obvious and more pictorial than others are, but they all convey a visual message. Each symbol system has its own strengths and weaknesses. 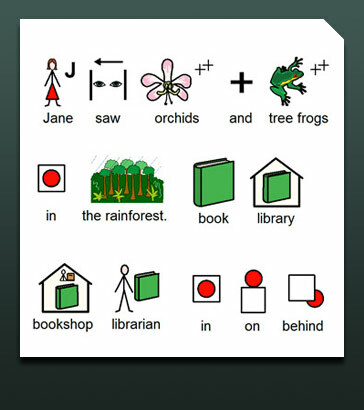 Choosing one particular symbol system over another should be based on the needs and abilities of the person using AAC. Some symbol systems are more pictorial than others. However, abstract language is always difficult to convey in a pictorial way. Read 'Using symbols for communication' to help you to decide which symbol system to choose and how to group them. Are designed to support written information and provide a way to effectively 'translate' written text into a simple and easy to understand form. Have a large vocabulary spanning standard curriculum topics, adult vocabulary and higher levels. Possess a schematic structure and include grammatical markers for literacy expression. The second set of symbols commonly found in schools is the PCS symbol. These were developed by Mayer-Johnson as a support for communication. 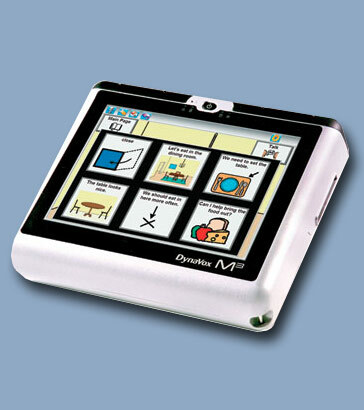 They are used widely in communication devices for face-to-face support. To learn more, visit the Mayer Johnson website. 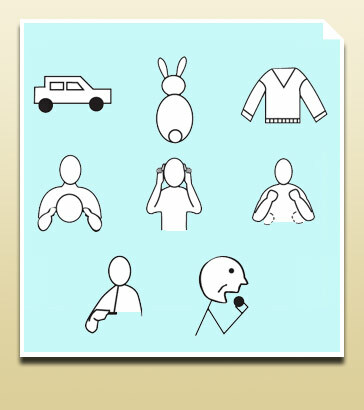 The third set of symbols commonly found in schools are those used in Makaton. Makaton is a language programme that offers a structured, multi-modal approach, using signs and symbols for the teaching of communication and language. Supplements and expands on each pupil's verbal communication. Enables a pupil to express emotions. Advances the access and understanding of the purpose of the lesson. Empowers pupils to become active participants in a group experience. Communication – making a symbol communication book can help people to make choices. Independence and participation – symbols aid understanding which can increase involvement, choice and confidence. 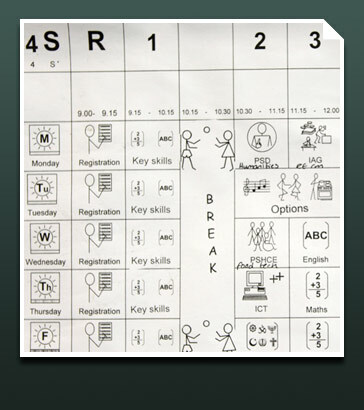 Literacy and learning – symbol software encourages users to 'write' by selecting symbols from a predetermined set in a grid. Creativity and self expression – writing letters and stories and expressing your own opinions. Access to information – all of us need accessible information and this should be presented in a way that the reader can understand and use. This text is abridged from the Widgit website. 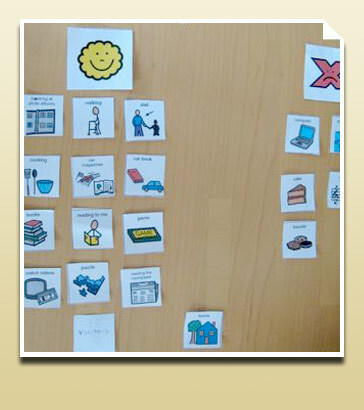 These provide pages of symbols that are usually organised by topic. The number of symbols used per page depends on the age and cognitive and physical abilities of the user. The topics depend on the age, ability and interest of the AAC speaker. 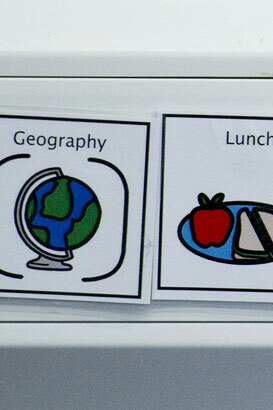 A pupil may have pages for play activities or food choices. In this document, find out how to create your own communication books. 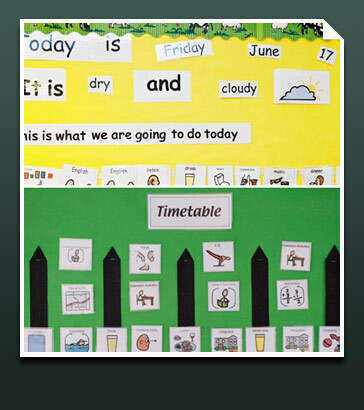 Symbols can be used in the creation of timetables, with symbols representing activities throughout the day. When each activity is over, the symbol may be removed, thus clearly recording the passage of time during the day or the week. 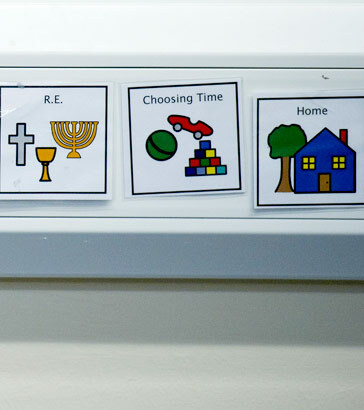 To the right are some examples of symbols displayed in schools. 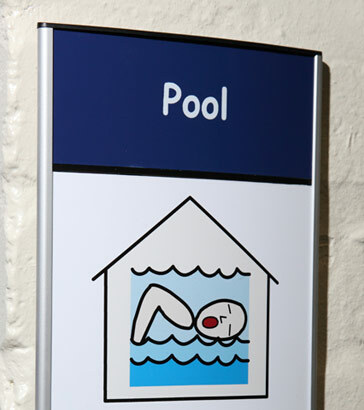 Talking mats are mats to which pictures or symbols are attached and re-arranged as required. Work out what it means. Say what they feel in a visual way that can easily be recorded. Talking mats should always be used alongside other methods of communication, not instead of them.